If you are interested to look at the futures charts for indices, commodities, softs, metals, etc, here are two great places to find them. These two websites offer free futures charts and personally I find them to be pretty useful. 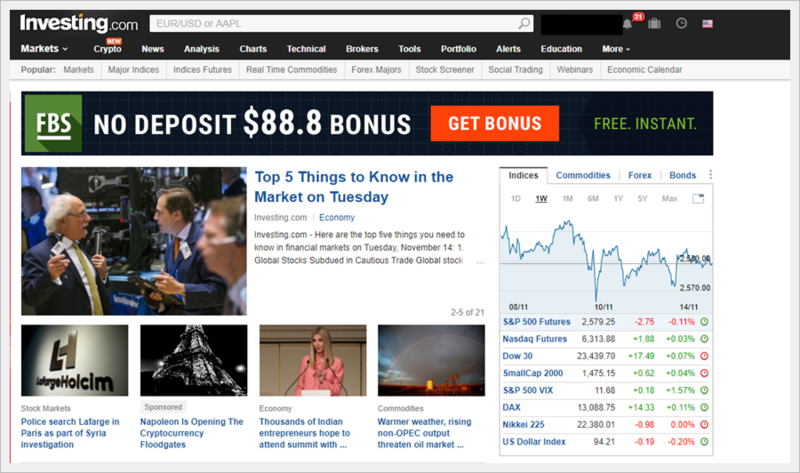 The first one is investing.com which is one of the most popular sites for all things investing and trading. The other one is finviz.com which allows you to see many futures chart in one page. When you discover these 2 websites, I think you will agree with me that you don't need any other website to view futures charts. Why Look At Futures Charts? For those of you who are wondering why we should look at futures charts, well there are a number of reasons why you should study futures. First of all, futures trade round the clock and they can often show us in advance how the regular hours will trade. I have often found that certain chart pattern in the futures will often foretell what the regular trading hours will do. A big correction or drop in the futures will often result in a big gap down in many many stocks at the opening bell. So, if you are long many stocks, sometimes its a good idea to short the futures to have some hedge on your positions. Futures charts for certain things like commodities are cleaner and have more trading volume compared to the regular etfs that you use to trade the commodities. Some of you may decide to trade the futures to avoid gaps. If you head over to Finviz.com and click on the Futures tab you will be brought to a bird's eye view of the various futures market. The bird's eye view allows you to see the quotes for different futures at a glance. Its very useful so you can keep up to date on the different prices. Just one glance and you are able to see how the indices, energy, softs, metals, meat, bonds, grains and currencies are doing. If you click on the charts tab, it will bring up many mini futures charts and i find these view very useful. You can switch from 5m, hourly, daily and weekly. Pretty useful if you want to check out the long term charts and the long term price trends of different futures. When you click on an individual futures charts like the Dow Jones Industrial Average, it will bring up a bigger chart of the index. You can easily switch between different markets to see how each is doing. You can also switch between the different time frames available. One thing that the free version will not give you are advance technical studies. For, that you will need to subscribe to the Finviz Elite. That will cost you around $25 per month. I have not personally tried it. 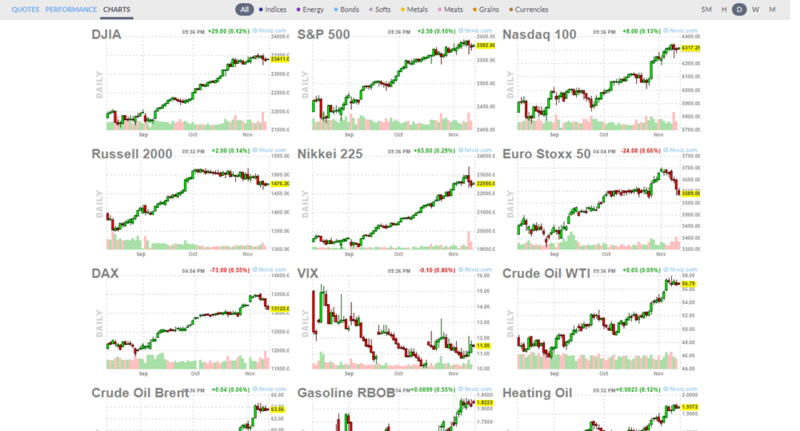 What is useful about Finviz is that they allow you to look at many different futures charts at a glance. Something that many other financial website out there will not allow you to do. It is very suitable for you to stay up to date with what is happening. But for serious analysis of futures charts, you will need to use other websites. Finviz is a very good website though if you are looking for a free stock screener. The Finviz Stock Screener - An Awesome Website To Find Stocks. Investing.com is one of the best websites out there that gives us futures charts. Actually they have almost everything that you need to make good decisions. But today we will be looking at their futures charts. This is their website. At the middle of it, there is a search box for charts. All you need to do is to type in the futures charts you need. For example, type "Dow Futures" to get the futures chart for Dow Jones Industrial Average. I'm amazed at the in depth data they give you. You can view monthly, weekly, daily, hourly, 15 min and 5 min futures chart LIVE! That's amazing when other websites might chart you money for live feed. Investing.com gets their charts from Trading View which is another great site for charts but I still prefer investing.com for their simplicity. Everyday I will look at the 3 most important indices in the world. The Dow Jones Industrial Average futures, the S&P 500 futures and the Nasdaq 100 futures. That's all we really need to look at to enable us to navigate the US stock market. There are other important sector indices to look at but if you're a bit lazy at least look at these 3 major indices. 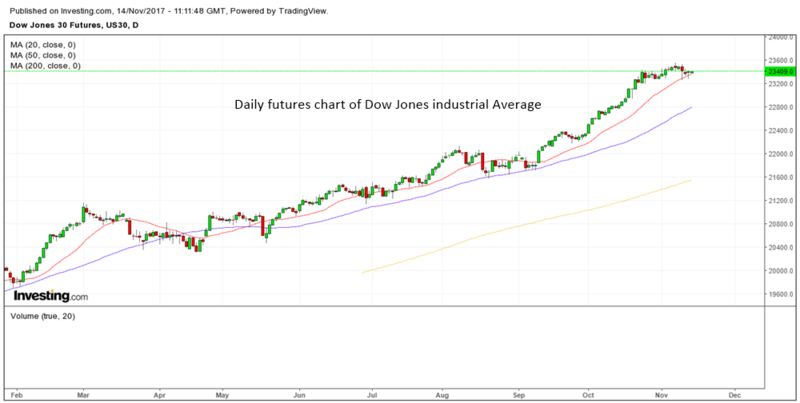 The chart above is the daily futures chart of the Dow Jones Industrial Average. I usually like to look at the daily chart, the weekly chart, the hourly chart, the 15 min chart and the 5 min chart for intraday trading. Well, basically almost all the time frame available! You can input your own indicators inside the chart. For example, I always have a 20 period moving average, a 50 period moving average and 200 period moving average on all charts. I use them to follow the trend and analyze trends. If you like to input other technical indicators such as the stochastics or the MACD Histogram and MACD lines, you can do so. 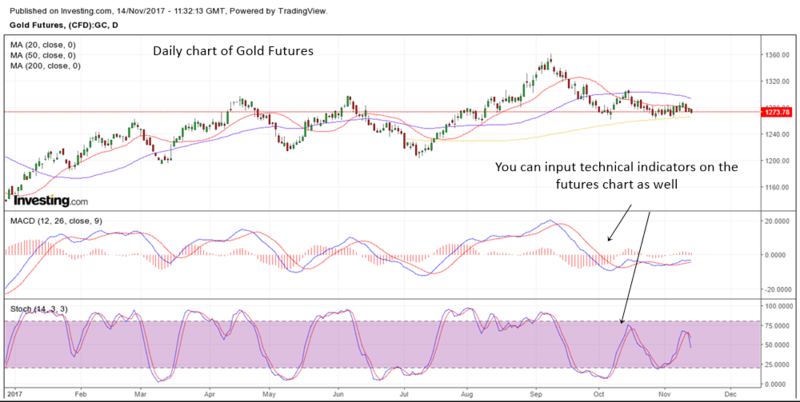 In the daily futures chart of Gold above, I put in the MACD (Moving Average Convergence Divergence) and the stochastics indicator. Do visit investing.com and try out their futures chart out. You can find almost any chart in the world at investing.com. So there you have it, two great websites to help you find futures charts. One that allows you to have a bird's eye view of the different futures charts (Finviz.com) and another one for more serious technical analysis (Investing.com). You do not really need to subscribe to a pay service nowadays. I think by utilizing these 2 websites, you can do 99% of the analysis that you need to be successful in trading.